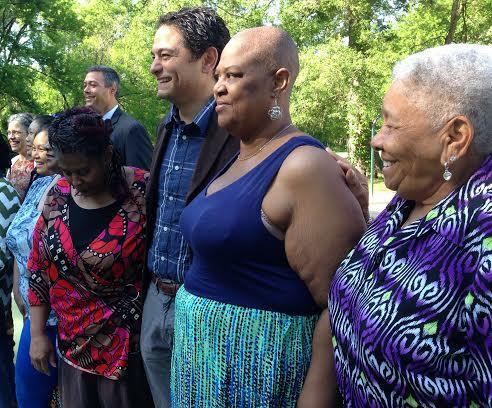 Chapel Hill Mayor Mark Kleinschmidt, center, joins South Estes residents for 'free' internet announcement. A big step is underway to help bridge the “digital divide” in Chapel Hill. Town officials announced today, along with AT&T, that residents living in eight of its public housing communities will soon have free internet service. The move is a long time coming, especially in a town that is already one of the most wired in the state. The South Estes Public Housing Community in Chapel Hill sits right off 15/501, near University Mall. The 44 units were built in 1970, are gray in color and probably need a little fixing up. But today, all eyes were on the basketball court, where Chapel Hill Mayor Mark Kleinschmidt made the big announcement. He said the following low-income communities will get free High Speed Internet for five years. Leoneda Inge reports on a program to provide free internet service in Chapel Hill's public housing neighborhoods. “Airport Gardens, Church Street Caldwell, Colony Woods West, Eastwood, my neighbors, North Columbia, Pritchard Park, Rainbow Heights and South Estes. Right here, South Estes!” said Kleinschmidt. Kleinschmidt admits it has taken a long time to get to this point – providing internet service to some of the town’s neediest residents. “Bridging that divide means having to overcome barriers, and that is one of the reasons it has taken so long. There’s been a lot of rhetoric!” said Kleinschmidt. There was the hardware issue: issues surrounding how to pay for such a service, and making sure users were computer literate. To help solve one of those problems, Chapel Hill is partnering with AT&T for the free service. “It’s hard to put a number on it. It’s great to give back to the community, it’s great. It feels good," said Doreauk. Several residents feel good about this new public-private partnership as well. Yvonne Degraffenreid has lived in the South Estes neighborhood for eleven years. “I’m glad to have it. I used to have it, but I don’t have internet anymore," said Degraffenreid. Degraffenreid said she has not had internet service for about three years, because she could not afford it. She says she needs internet service mostly for her daughter who is in school. A recent Town of Chapel Hill survey of public housing residents with school-aged children found one in four households had no internet access at home. Darren Bell is Manager of the Community Connections Program for Chapel Hill-Carrboro City Schools. It’s his job to make sure all children have what they need to succeed and that means closing the digital divide. Bell says most of the students in need of internet service probably don’t live in public housing. “Within the Chapel Hill Carrboro City School District, we have over 3,000 kids that qualify for free and reduced lunch. That doesn’t mean that every one of them needs internet access and are not paying for it. But- 3,000 kids. In public housing, there are only 360 kids," said Bell. The Kramden Institute has stepped in to also solve another problem. They are providing free computer literacy classes for public housing residents. Those who complete the four classes get a free laptop – because who needs internet if you don’t have a computer.